Let the Event Photographers compete for your event photography! Do you want the best event photographers to capture the un-forgettable moments of your event and want to stay in your budget too? Good news is you have reached to the RIGHT place! At Servicelance, post a Free job to explain your event photography requirements and start receiving Event Photographers competitive quotes specifically quoted for your Event Needs! That's SIMPLE, EASY & FREE! What can you do through Servicelance? 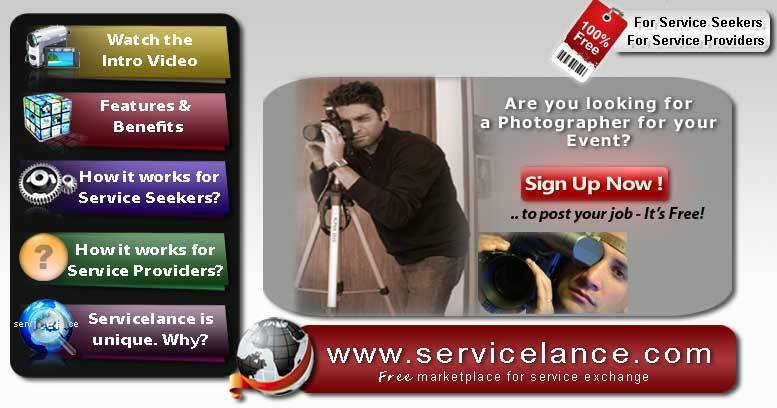 Find and reach Event Photographers for free. Submit your job requirements - Free. Get competitive quotes from both Indivisuals/Freelancers & Businesses. Close deals with Event Photographers as you prefer, pay directly to them. Provide and Receive feedbacks when your job is done! Get Started Now! - Its Free! Are you a Photogrpaher looking for Photographer Jobs?